What do you love about golf the most? Is it the beautifully manicured greens, the deafening quietness that surrounds you as you take your shots or the exclusivity of the clubhouses that attract you to the sport? For some, they love the extremeness of wild swings, the blooper-filled hazards or the all-you-can-drink bars at the clubhouse. If you are asking can golf be considered an extreme sport, here are some components to contemplate. Are you an extreme golfer who wants to learn how to improve your golf swing? On a golf course, it is all about your driving potential. What could be more extreme that hitting your golf ball 300 yards? Let your golf clubs create your version of the Tiger Slam. If you watch golf regularly, you know that most hazards are tedious and overcome with ease. Sometimes, though, a legend like John Daly will come along and prove just how extreme golf really is when it comes to water shots. While competing near the 17th hole at the Chubb Classic, Daly decided to play the ball where it fell in the water, shoes on and all, rather than take a drop which would come with a one-stroke penalty. That’s extreme. One would get the impression that talking is not allowed. In fact, most people tend to do business, make plans or discuss life while at the tee boxes and on the greens. While the pros often stare down a talker, most people who play golf at their local clubs enjoy the social aspect of the game. Interestingly enough, the scientific community agrees that talking and socializing when playing golf actually are better for your health than most realize. The socializing aspect is also what attracts more than 2 million new players annually. Did you know that there are bars in the clubhouses? What could be more extreme than that drinking recommendation? In fact, Golf Digest notes that it serves the role of swing oil in which makes one play more like Happy Gilmore. Golf Digest also performed such an experiment that the more alcohol consumed, the more excited the players felt. 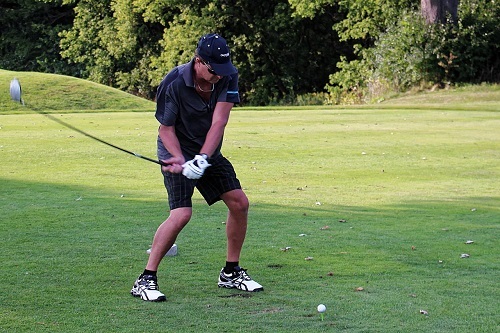 If you want to feel more extreme when golfing, throw back a few between holes to liven it up. I prefer to walk the 18 holes said no golfer ever. Golf carts are just a part of the game that can be fun and friendly. While you don’t have to take the hills at high speeds to feel butterflies flying over them, golf carts allow you to experience more freedom on the courses. It also allows for a freer flow of traffic which helps get golfers going faster. So, can golf be considered an extreme sport? It depends on whom you are asking or watching on the PGA tour. What is noticeable is that the sport can attract new blood for this type of experience. This entry was posted in Other Sports and tagged Golf. Bookmark the permalink.